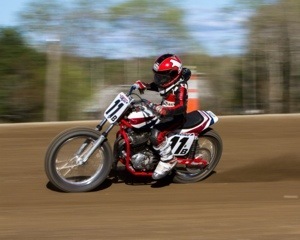 Last Saturday was the start of the flat track racing season at the ever popular Square Deal Riders Motorcycle Club in Port Crane, NY. The day started out with SDR’s annual Rites of Spring Ride presented by American Spirit M/C. The Club had a great turn out for the ride as well as fantastic weather with temps in the 70’s and blue sky’s. As early as 1:30pm the pits started to fill up for the first race of the season. This proved to be the start of something good, with 224 entries, the second largest field of riders in club history. The entries included riders like Grand National points leader Brandon Robinson, Raun Wood, always fast Ryan Wells and Pro Singles winner Jake Constantine. Multiple Grand National Champion Chris Carr was also on hand selling tires for Golden Tyre USA. The track was in great shape, like it always is with the hard work from club members that put on a great show. After the practice sessions finished Mike dragged the track to bring the deep cushion back down, and get ready for the large amount of heat races. 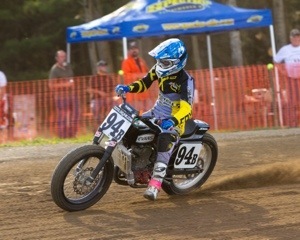 Both 60cc-80cc classes had two heats each. This shows that the future of the sport is strong and growing. Open expert ran four qualifying heats making it tough to get a front row start for the main later in the night. Fans from all over filled the grandstands on the front stretch to watch the bar to bar racing that SDR is known for. The heat races had the fans on their feet with close racing from the 60cc class all the way up to the fast Open Expert 450 class. The quad classes where big as well making for some close four wheel racing on the loose surface at SDR. Open Expert Bike was the first Main of the night. 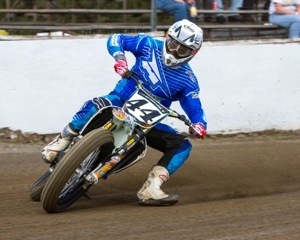 The riders picked their spots on the line, looking to get the ever important hole shot into turn one. As the green lights flashed on, the roar of the big bikes filled the air and the riders headed into the first turn. The top five riders ran close for the first part of the race. It seems like the mains go by so fast leaving me wanting more every time. First to the checkered was no. 59b Jake Constantine, with Justin Velicky in the runner up spot followed by John Wood, Ryan Wells, and Chad Cose rounding out the top five. Justin Jones, Ryan Wells and Jake Contantins finished on the podium in the 450 expert class. Quad Expert was also a very good race with Cecil Knight getting the victory with Tom Donahue, and Thomas Hawk giving him a run for his money. May 18th is the next race at SDR which will be a regular District 3 points race and also a 15 lap Championship Main for the exciting Quad Class. Come on out and see some of the best riders in the north east.